"My 19-month-old son loves yogurt and squishy fruit but they're soooo messy. This way he can get both in a cool treat with no unnecessary sugar, and I can just hose him off afterward!" Blend yogurt, mango, pineapple chunks with juice, banana, and orange juice in a blender until smooth. 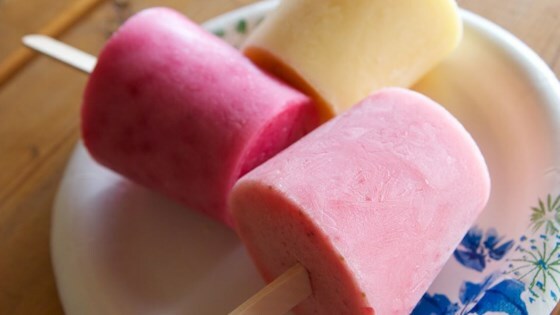 Pour into ice pop molds; freeze until set, 4 to 6 hours. We are in love with the Tovolo® molds. They are easy to use, stay upright in the freezer, and easy to clean. Refreshing and Delicious and easy to make. Made as is but only have 1 set of 4 popsicle mold. Blended the rest with ice, milk, and kale and kids loved it. i loved it even after a long day of hard work they were super good i needed this it was so hot lol i will definitely be making them again!